Boy am I happy to see The Sea Shepherd finally framed. I’ve yet to put Ornamental Lighting: The Green Range in the frame, because it’s a laborious process and one I don’t really enjoy (I think I’m going to start going to a framer’s instead of ordering the frames online, even though there is a big mark-up for basically waiting a lot longer for the frames which is like…what now?) But still, might give it a try. 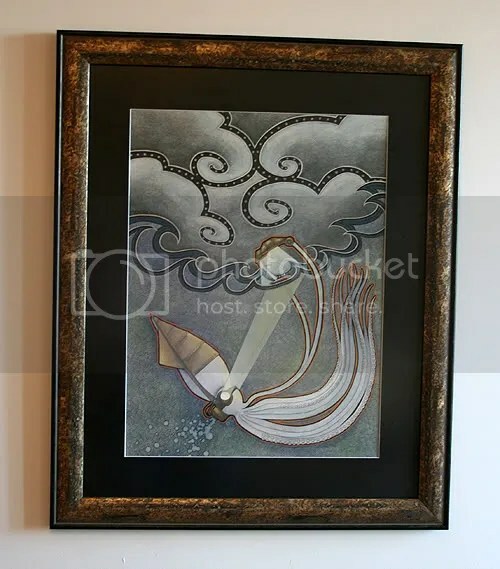 This entry was posted in artwork, exhibition, steampunk, traditional artwork and tagged brass, bronze, colossal squid, giant squid, illustration, ink, ravenari, seas, steamer, steampunk, storms, stormy seas, the sea shepherd, traditional art, watercolour pencils. Bookmark the permalink. Ha, i’ve only just noticed the sea and the clouds, they’re great!